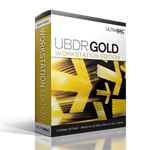 UBDR Gold provides a fast and easy disaster recovery solution for individual workstations. The software functions in the exact same manner as the UBDR Gold Server Edition. Same amount of great protection and easy recovery for the single desktop or laptop.